Nine hundred metres above sea level, two kilometres from the Vatnajokull, Europe’s largest icemass, we drove our Land Rover down the slope towards the ice. A small dip forces us to slow down, suddenly the rear of the vehicle quickly settled in the earth. We leapt out, and saw our vehicle axle deep in slimy thixotropic (quick) mud. 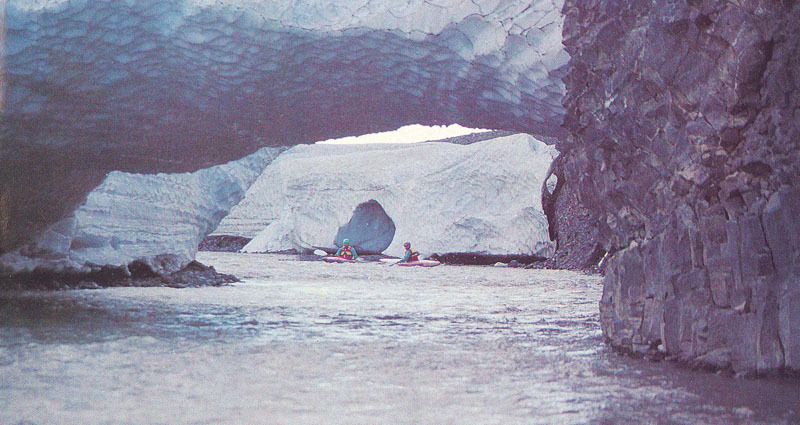 Three members from Sheffield University Canoe Club, Ian Bamsey, Trevor Illston and myself decided in January 1989 to go kayaking in Iceland. For this proposed trip we would need a good 4WD vehicle, unfortunately our financial resources were severely limited. 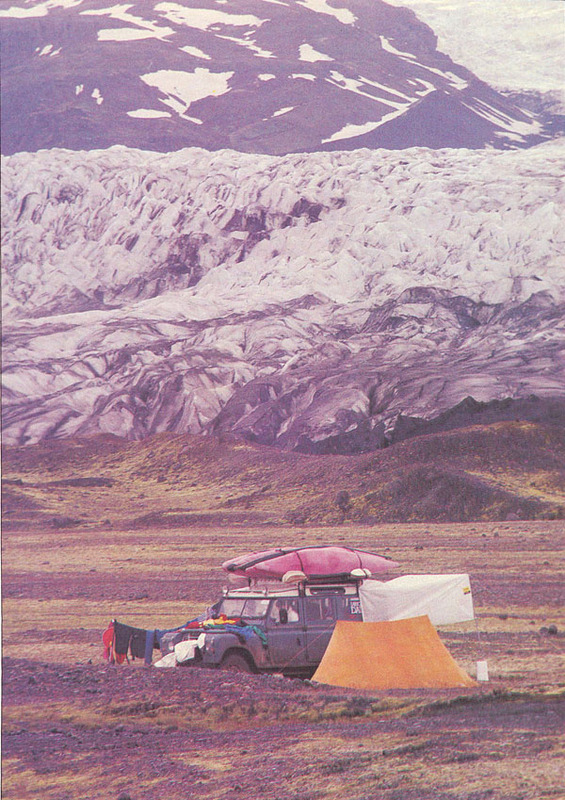 One month before our date of departure we bought a copy of “Auto Mart” and started looking for a diesel Land Rover. After a few scares in shady garages in the back of Sheffield we found a private sale that seemed to suit our needs. A 1971 long wheel base Series IIa model. At £1,450 it seemed a bargain, however it was clear some work was needed before we could set off. A month of hard labour ensued during which we replaced the injectors, tyres, brake pads, shock absorbers, front axle gaiters and numerous oil seals. We also took out most of the seats and fitted running hot and cold water. (The hot water system had a heating coil in a tank of water fed from the cooling system. With a few problems this worked throughout the trip). We were ready to set off on the day scheduled, July 16th, Trev’s 21st birthday. We left Cheshire at 8pm (to arrive Aberdeen 4pm the following day) to calls of “oh look the fuel gauge has broken”. The gauge hadn’t broken and 2.4 miles from home we chugged to a halt outside a garage and quickly refuelled. Despite all these problems we arrived four days later in Seydisfjordur, Iceland. 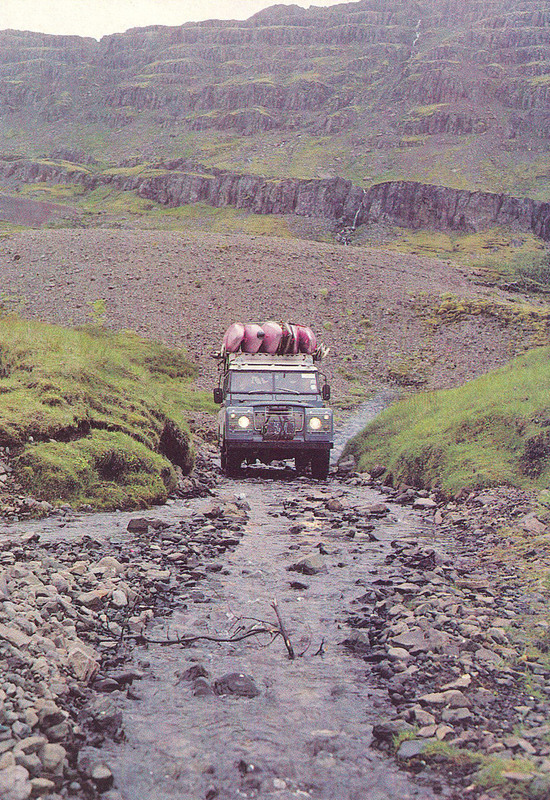 We had heard many stories about Icelandic roads and were not sure how much to believe. The road from the port was tarmacked and seemed OK. However the tarmac ran out after about 3 miles and the standard gravel road appeared. With diesel at about 14 pence per litre (but heavy road tax for diesel vehicles) we set off south to do some kayaking. The main road (Route One) is OK to drive on. It’s mostly gravel, with loose edges and a compact centre. There are so few vehicles that you can drive down the middle, only needing to venture to the edge when passing. We drove to the south of the island on the main road to a lake, Jokul-sarlon, which is adjacent to the Vatnajokull ice cap and contains huge lumps of floating ice. Since James Bond used it for the start of “View to a Kill”, we considered it a suitable start point for our exploration of Icelandic waters. Our search for rivers took us a few miles further north to the Giethellnaa. It was time to plunge off Route One again and hit the track. The track on the south of the river took us 15 miles to an excellent site for kayaking. It proved a harder drive than the Loni, mainly due to small streams that had washed deep ruts into the track. The tow hitch often ploughed into the ground and we bottomed out several times. After some top class kayaking we were ready to set off down the valley. Five miles from the main road a sharp crack was heard anfd the phrase “deep trouble”1 sprang to mind. We leapt out to find the spring hanger at the front had snapped off about 150mm from the connection with the spring, letting the front wheel on the driver’s side rub against the body work. The vehicle was still capable of forward motion and we drove at 3 miles an hour to the nearest farm. A brief conversation secured the use of a welder and grinder and the farmer helped us weld an 11mm thick plate to the chassis to rejoin the two parts. A cup of coffee and we were on our way. 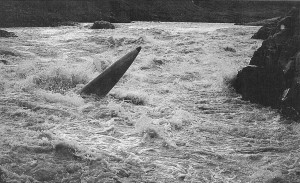 The Hamersa, the next river to the north provided similar driving and kayaking conditions as the Geithellnaa, but without the chassis problems. After several hundred miles of driving several of the floor reinforcing strips at the rear of the vehicle came loose and were removed with brute force and ignorance. No short term problems seemed to arise from this. After kayaking several more rivers in the north we decided to take a few days off and go for a trip into Iceland’s interior (poor tracks, no settlements or garages). 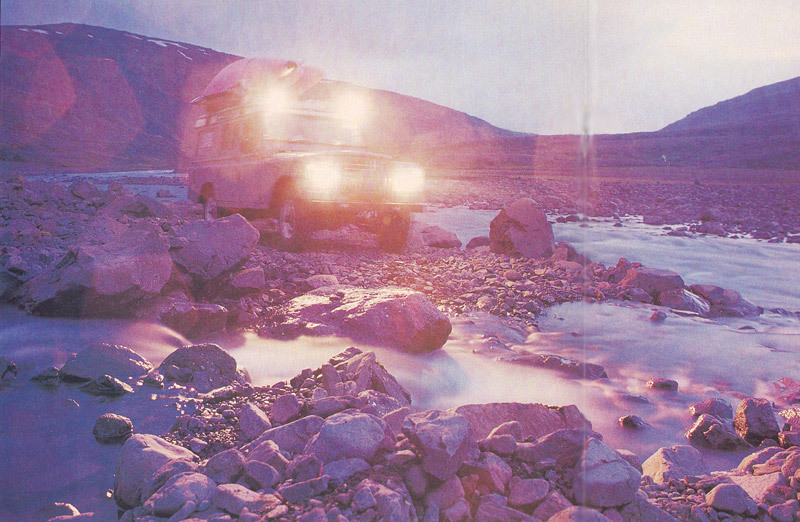 We set off for a 250 mile journey up the Fjdllum plain to the Vatnajokull and east to the Jokulsa a Brii, equipped with our extra tank of diesel strapped to the front bumper. After a very bumpy piece of track a loud clunk was heard, and after a very brief inspection it was clear that our jerry can had fallen from the front and been run over. This completely ruined the tank, spreading two pounds worth of diesel on the road. This limited our range and meant we had to cut off one track we had intended to explore. There is some incredible scenery here, empty plains with huge mountains jutting out several thousand feet. The driving was hard work, deep sand drifts constantly forming on the track. After a long drive on the main tracks we branched off to the south, and towards the icemass Vatnajokull, the track got very indistinct and we lost it several times. 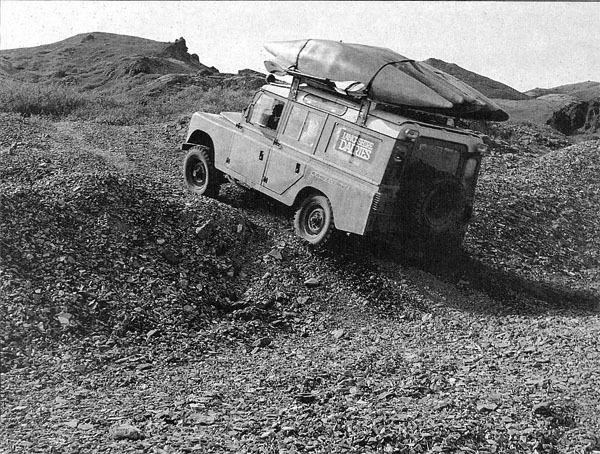 It was on this part of the trip that the Land Rover got stuck in quick mud (oh for a high lift jack). Despite this minor set back we found our way back to the mapped track system and headed north just to the west of the Jokulsa a Bru. It was one of our aims to kayak a canyon in this region, however, after a long recce we found this was not to be, due to difficulties in water conditions. This quest, however lead to substantial damage to the Land Rover. To get to a suitable place on the river we had to drive 20 miles on a very poor track. This was not marked on the maps and the route was pointed out to us by a local farmer. The last three miles of the track were on soft ground with hard ridges running at all angles to the track. This caused a twisting motion to the vehicle that seemed unavoidable and cracks could be seen forming in the chassis, especially near the outriggers. The time had come to carry out the main objective of our expedition. This was to kayak, from as high as possible to the sea, the Skjalfandafljot or Shaking River. To do this we would need to drive back into the interior and approach the north west corner of the Vatnajokull. We drove up the Skjalfandafljot valley along a good track, frequented by coaches. A day was spent preparing food for the descent before we drove off the main track towards the source of the river. After only two miles on this track another worrying clunk was heard followed by a depressing loud roar. The exhaust pipe had snapped off just where it bends under the rear seats. This was only considered a minor problem and we continued. We found a suitable put in where a snow bridge crossed the river (by now only 4m wide). 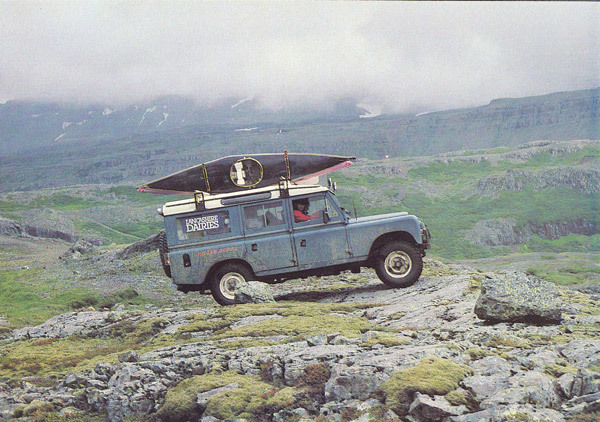 Since there were only three of us on the expedition and all of us kayaked, one had to drive the vehicle to the sea and then hitch back to the base camp (120 miles each way). I picked the short straw and left base camp at 10pm. After dropping food at strategic points on the river 1 arrived at the sea at 7am the following morning. Two hours sleep and 1 set off to hitch. The lift came after an hour and took me 10 miles to Godafoss, now I was on the track. The rest of the day only saw me go another 20 miles. The second day of hitching saw my first lift at 2pm, and stopped 20 miles from base camp, fully expecting to walk the last section. However at 11am, after only one hour walk, I spied a Land Rover approaching with British plates. Frantic thumb waving brought him to a halt and 1 had a lift. Many thanks go to the English Land Rover enthusiast, who not only took me to with in 10 yards of the tent, but also gave us fresh bread and eggs, which were eaten as soon as he had left. The kayak descent was performed without too much trouble and the burden of high wind speeds and driving rain was eased on the fourth day when an Icelandic farmer asked me if we would like to come in and warm up. We ended up staying the night and left the next morning with dry kayaking gear for the first time in four days. This farmer also helped us repair the exhaust pipe, much to our relief since the vehicle had started to smell of diesel fumes. We were coming to the end of our trip, and after a few short runs in the north east we set off towards Reykjavik. On the way south I was in the back and noticed that the door had started moving relative to the frame. We leapt out in the usual manner and found that the main chassis member on the driver’s side had broken all the way round, adjacent to the rear shock absorber. Incredibly the vehicle still rolled and as most of the roads were surfaced we headed to Reykjavik. We got to Iceland via P&O Lines to Shetland (from Aberdeen) then Smiril Line to Iceland. Cost £660 for the Land Rover and three people. We flew home via Icelandair for £150 each and the Land Rover returned by Eimskip for £380.